On January 29, 1783, Connecticut became the first state to pass a general colonial copyright law, entitled “An Act for the Encouragement of Literature and Genius.” Printing books in the colonies got off to a slow start. At the time, many colonial authors still sent their manuscripts back to the established presses in England. The few printers operating in the colonies made their living printing proclamations, sermons, broadsides, and newspapers as well as by selling writing supplies, stationary, and imported books. Larger and lengthier works could be produced far more cheaply in London, and law books were almost the only printed books in the colonies before 1740. But by the revolutionary era, authors became worried about protecting their rights. It was not uncommon for a printer, who had been paid by the author to print a set number of copies, to produce extras to sell on the side. Also, another printer might copy and sell the author’s book without permission. In October of 1781, Andrew Law, a singing master with ambitions to publish a music book, petitioned the Connecticut General Assembly regarding his volume, A Collection of the Best and Most Approved Tunes and Anthems for the Promotion of Psalmody. Law was granted an “exclusive patent” for a five-year period. At that time, patents were the only form of protection for an author’s work and legislatures generally granted these private bills for relatively short periods. Another vocal advocate for copyright was Noah Webster, a Connecticut schoolteacher and member of the New York bar. He had completed the first volume of his three-part American textbook, A Grammatical Institute of the English Language. Webster, also concerned about safe-guarding his rights, sought protection for what would become known as the “blue-backed” speller. In 1782, he petitioned the legislatures in New York, New Jersey, Pennsylvania, and Connecticut for general copyright protection. His efforts, however, proved unsuccessful. Ultimately, it was John Ledyard who succeeded in securing the first general copyright protection, which set the precedent for other colonies to enact similar laws. 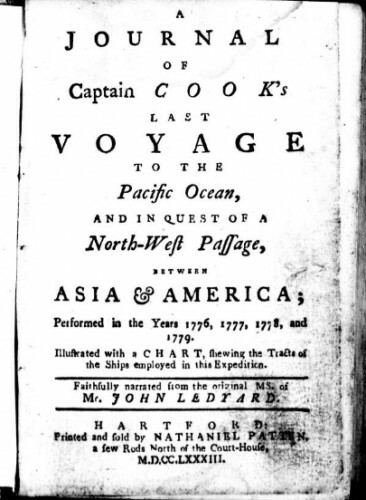 The author of A Journal of Captain Cook’s Last Voyage to the Pacific Ocean, Ledyard petitioned the Connecticut General Assembly and was granted copyright on January 29, 1783. The General Assembly, instead of passing a private bill for Ledyard, issued the first general colonial copyright statute. It secured the rights to the author for 14 years with the ability to renew the copyright once. Nathaniel Patten in Hartford printed Ledyard’s book in 1783. Lowens, Irving. Copyright and Andrew Law. New York, NY: Bibliographical Society of America, 1959. Wills, Elizabeth Carter, and James Gilreath. Federal Copyright Records, 1790-1800. Washington, DC: Library of Congress, 1987. Deazley, Ronan, ed. Privilege and Property Essays on the History of Copyright. Cambridge, UK: OpenBook, 2010. Link.